19th Barrel O’ Fun – Arena Bordem Break! 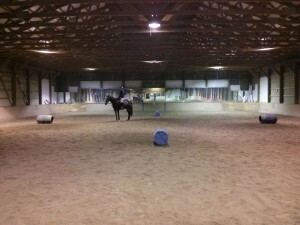 Well, we have had 2 weeks of indoor-arena weather and I’m bored out of my mind already. I hate riding indoors, mostly because my horse hates indoors. He’s claustrophobic, doesn’t like riding with more than 2 other horses in the ring, and when the weather turns—he turns… into a big grumpy beast! So we’ve learned to deal with it. I don’t get in the saddle without setting up some sort of obstacle. My theory is if I set up a game for us, he won’t subject me to his own games (which are not my idea of fun). So after 2 weeks of No-Stirrup-November torture, it was time for a break in our equitation work. Level 1/Day 1: The first day I rolled out some barrels and just got Oz used to them. I literally gave them a kick and let them stay wherever they landed. I warmed up walk/trot around them, using the barrels as pivot points for circles, to bend in and out of, and halt in front of. Halting in front of the barrels is important. It gets Oz between my hand and leg, and keeps me thinking “Halt Straight” as I have a visual reference (the barrel). The first time I halted in front of one of the barrels it was about 10 feet in front. I gradually got closer until he was trying to jump the barrel after I halted, at which point I backed up a few steps and then trotted forward over the barrel! I might do this just to break up our regular flat work. It’s fun and a good test to make sure I’ve got Oz between my hands and leg, as he often lulls me into a hollow trot and stops working from behind (Labour Faker Champion of 2013). Level 2/Day 2: I decided to up the challenge/fun and set up 4 barrels on a circle. As you can see in the video, I started with just 2 barrels, parallel to each other. I went around a few times each way, until Oz relaxed into a better rhythm and wasn’t hopping as much (he gets ‘sticky’ sometimes). If he got really stuck, I would take a little gallop around the arena, halt, walk for a bit and start over. Level 3: Roll-back! I tend to get stuck in corners, and stop riding forward (as you can see in the video). Doing roll backs out of the corner and jumping the skinny barrel kept me riding forward, and Oz was really getting his eye on the jump and going for it. We’re jump-off ready now! Level 4: The circle of death! The final test was doing all 4 barrels in a row. I got my canter going before I approached the first barrel, and looked to the next one… and missed it. I halted and started again, this time making less movement with my body over the first barrel, so I could sit up apply my outside aids, lift the inside rein, and ride forward to the next barrel. We got over the next barrel in 4 strides, and started riding to the next in 4—Bingo! I looked to the next barrel, got to it in 3 and a half and decided that maybe I let Oz find his forehand a little too easily. It was time to pull up again and start over. A couple more attempts and we had it down pat.